This evening, the Skerries Coast Guard team were tasked to investigate reports of a yacht aground near Donabate beach. Several concerned members of the public had notified the Coast Guard’s Maritime Coordination Centre to report that the yacht, with one person on board, may require assistance. The yacht had been attempting to enter the narrow channel of the Malahide Estuary, however the unusually low water levels from the falling Spring tide resulted in the yacht running aground near the channel entrance. The Skerries Coast Guard team arrived at the scene and quickly established that there was no imminent danger to the yacht or crew on board. The crew’s intention was to wait for the yacht to refloat later that evening with the change of the tide and continue on their way. No further action was required and the Skerries team were stood down. 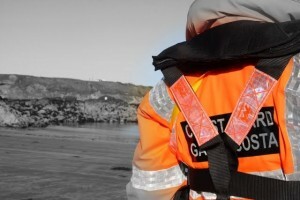 Remember – if you spot someone in difficulty along the coast dial 999 or 112 and ask for the COAST GUARD. Your call could save their life. This entry was posted in Callouts and tagged Callouts, donabate, Incident, Irish Coast Guard, skerries coast guard, yacht by Skerries Coast Guard. Bookmark the permalink.